Drip-Tip 510 Honeycomb Wide Bore, Acrylic and 510 Standard. This drip tip with an opening of 13mm ameliorates the production of vapor. Adapted for clearomisers and atomisers of 510 Standard. A handsome drip tip in Acrylic with a mouthpiece of 13mm in diameter for a good production of vapor. The aeration is re-inforced by adding supplmementary openings. It equally modifies the look of your Electronic Cigarette. The drip tip is adapted for claromisers and atomisers with the 510 Standard. Très déçu de ce drip tip. 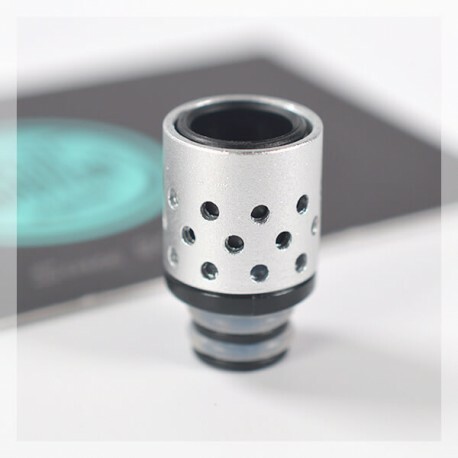 Les aérations ne sont pas reglables (beaucoup trop aerien), le drip tip ne s’enfonce pas completement quand on arrive à le mettre car les joints doivent etre trop grands et se pincent lors de l’enfoncement. Pas aimé et très fragile ( en plastique) Cher pour ce que c'est.